Possibly my favourite season for colour and style. As I'm obsessed with rustic tones and those cosy nights in snuggled in front of the fire watching rubbish TV. I have a lot on my wish list for Autumn interiors that I thought I'd share with you all, because there are some adorable and gorgeous autumn stock available right now I think you should all know about. 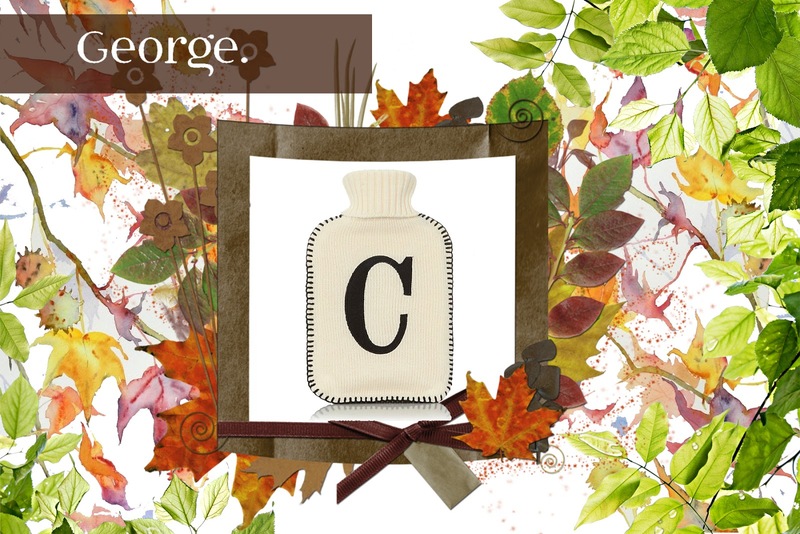 A new seasonal fruity and floral scent from The White Company with notes of amber, musk and pear will definitely have you feeling like your in a country park collecting conkers and crushing leaves under your boots. 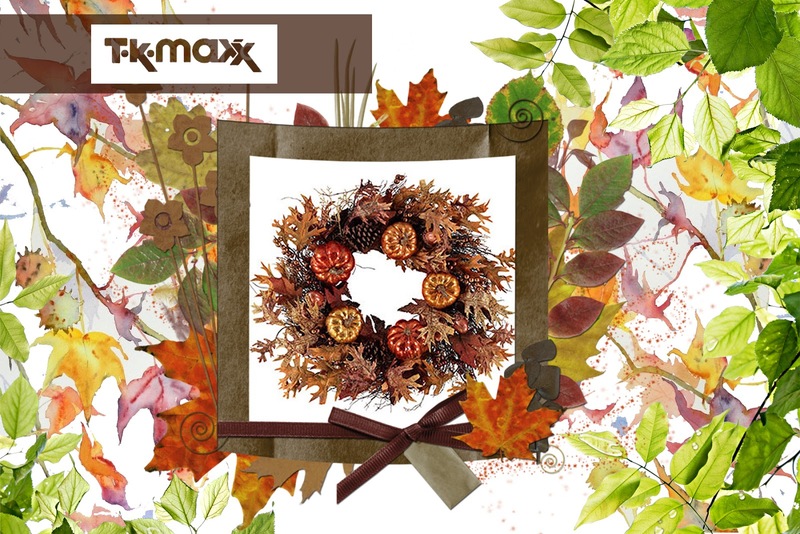 Decorate your door with these gorgeous season wreath. These autumnal colours with change your room to that cosy feels by bringing the outdoors in. It's perfect for Halloween with the tiny little pumpkins attached. I'd either hang this on my door or above my fireplace as a wall hanging. I'm obsessed with this fox and hedgehog bedding set with brushed cotton sheets which are reversible to which animal you're in the mood for. Bed sheets are a great way to update your room at low cost and these adorable hedgehog printed bed sheets are just too cute to pass! Circular cushions are a great addition to a sofa, bed or chair and using soft furnishings quickly updates an area. This adorable badger cushion is the perfect autumnal sofa accessory. 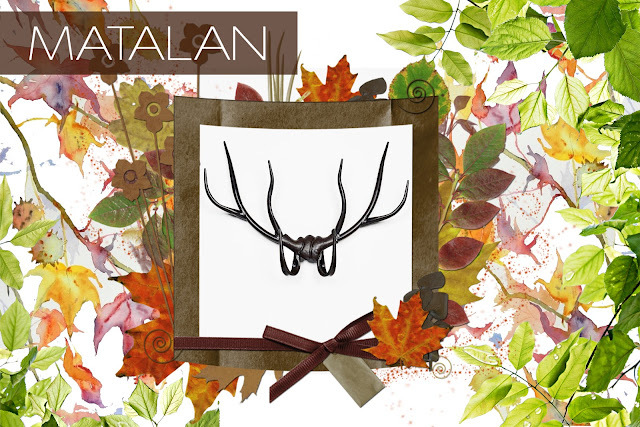 It wouldn't be getting towards winter without the addition of some stags or antlers now would it? 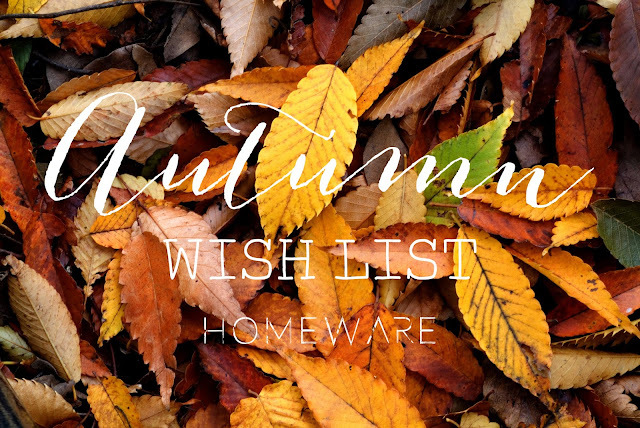 I have lots in my home all year round but for me, you can't have too many. This affordable antler wall accessory is perfect for a bare space in your home or even use it as a hat or coat rack. 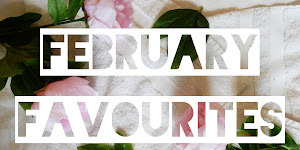 We update our rugs a lot through the year depending on the season or look we're after. This gorgeous retro style rug has stunning autumnal tones in it and would look amazing place under a coffee table. Another great piece to update your room inexpensively is to use throws. You can collect these through the year with maybe a white one for spring, colourful one for summer, brown, beige, orange or yellow for autumn, and red or green for winter. They change the look of your sofa instantly and are another great addition to your living room when those colder night star closing in too! A cosy living room snuggled under a throw is not complete without an adorable alphabetised hot water bottle ready for winter. Personalised items like this make great gifts for Christmas too. Printer crockery is a personal favourite of mine and I think it really adds a nice unique touch to the dining table, and brightens up your shelves. These adorable printed bowls in autumn colours are another inexpensive way to update your rooms. Copper tones are hot in autumn and looks great all over the home, even the bathroom. 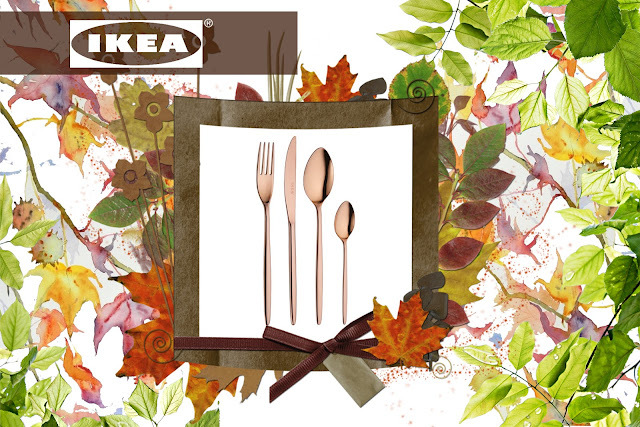 Making your kitchen or dining table autumnal could be slightly more difficult but not with this stunning coppery cutlery set - I'm in love. So they are the pieces topping my homeware wish list this autumn. Let me know if you like to keep your home seasonal and are looking forward to the cosy autumnal nights. I'm a lover of a cheeky alcoholic beverage and my favourite kind of tipple is white wine or gin. 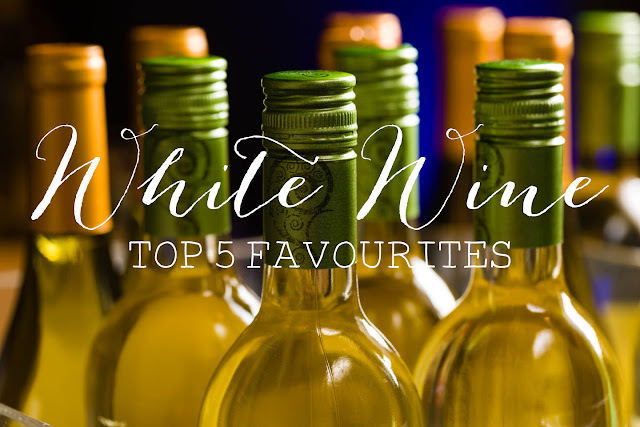 Over the summer I've been experimenting with different white wines and I've gathered quite a favourite collection, which I thought I'd share with you! Bright aromas of nettles, melon and grapefruit. The palate delivers juicy citrus and guava flavours with elegant acidity, giving a long refreshing finish. A wine of remarkable intensity and style. This wine is full of characters - intense tropical fruit punch. Crafted using grapes from three of Chile's coastal regions. This cooler climate brings out the best qualities as the grapes ripen later, allowing the intense fruit flavours to shine through. A refreshing light-bodied Sauvignon Blanc with zesty peach, citrus fruit and gooseberry flavours. "...as I rowed closer, to the deepest part of the river, the sight of the lone fisherman slowly faded before my very eyes until I reached the point where he had been... The fisherman and his skiff had disappeared entirely, as though they had been a vision, or possibly a phantom..."
Named after this mysterious sighting, Phantom River Sauvignon Blanc has enticing aromas of citrus followed by crisp, concentrated flavours of tropical fruits with hints of lime, leaving a long, lingering finish. This juicy, intense Sauvignon Blanc is perfect with smoked salmon, lobster dishes or even Caesar salad. What's your favourite White Wine which should I try next? My favourite time of year is definitely autumn and winter. I absolutely love the colder weather, darker nights and the excuse to stay in watching a movie in front of the fire. Tom and I have nearly lived at our first little home for a year and I'm getting tempted into autumnal and wintery interiors to prepare for our favourite kind of evenings snuggled on the sofa. H&M have some amazing new stock which is inexpensive and gives you an affordable way to update your living space ready for autumn and winter without breaking the bank! I'm obsessed with dark colours this season and mixed metals. I love playing with textures, patterns and block colours as I think they really transform a space. I've noticed a lot of greens, blues and blacks this season as well as silver, gold and black all making a comeback and taking over the copper trend. 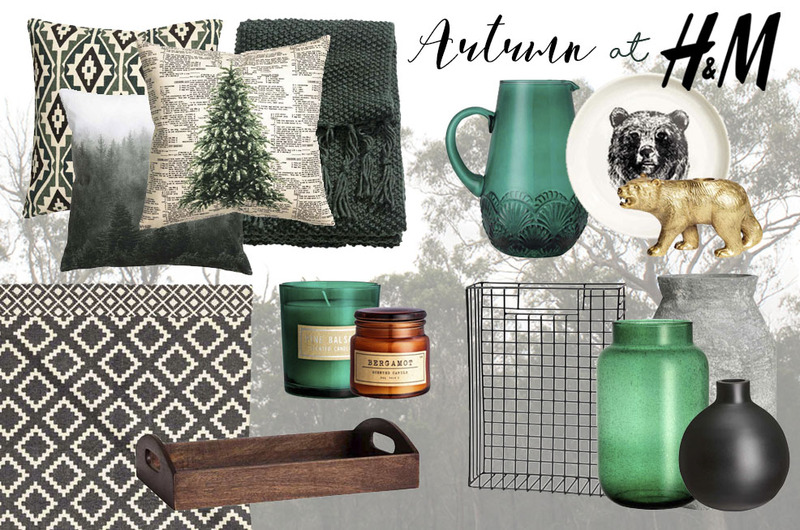 Scrolling the H&M Website has inspired me to create a Autumn Mood Board as an affordable way to update my living space into a cosy autumnal area ready for those colder nights. All these items are from H&M Home at amazing affordable prices. Cushions, rugs and blankets are a style and comfort essentials when entering the A/W season as they add warmth and comfort to a space as well as accessorising sofas and floors with a cosy touch. H&M have a great range of cushions covers whatever your style and taste. I'm feeling greens this season and H&M have a fab selection of different patterns, textures and designs on their cushion cover offering. I particularly love the one printed with a Christmas Tree to get you in the festive feeling. A aztec patterned rug is a great staple piece as it works in lots of themes whether you've got a modern or retro style they add a really good touch of pattern to a room. Candles, candle holders and vase may sound like an old-school choice these days, however I really think they add to a theme and do come with function too. Vases are perfect to pop on those pieces of furniture you don't use every day and really add to a space by giving height, colour and texture to a room. I particularly like vase arrangements in twos or threes and thing contrasting textures and finishes really complete a space. H&M have a great selection of unique decoration piece and I'm definitely going to popping their vases on my Christmas list! One of my favourite things in the world is furniture, working in furniture retail I love how furniture can transform a space. But so can the accessories you add to a room. For example this rustic tray from H&M featured about can be of such use and add functionality to a coffee table or ottoman, and become multi functional as a dinner tray etc. The other piece I love is the industrial magazine rack which is so handy! I use these for magazine or for putting blankets or firewood in, I love the wire industrial look and love mixing the style with different trends, eras and themes. I think the industrial look really works against most interior looks, I have so much of it in my house with my vintage/rustic theme. I've never been a fan of bathroom accessories and I find them all very cheap, tacky and dull. We have large roll top bath that is very, very deep you almost sink into it! I'm actually much more of a shower person but I was feeling like something was missing from our bathroom, and I had a really cool idea! I took to eBay to hope to find a local person selling a large piece of wood over a specific length, so that I could use it as a unique and stylish bath rack! Fun, functional and rustic perfection. Tom is always having baths and is the kind of person who loves to spend a lot of time in there, with a film on his laptop, candles and his phone close by. 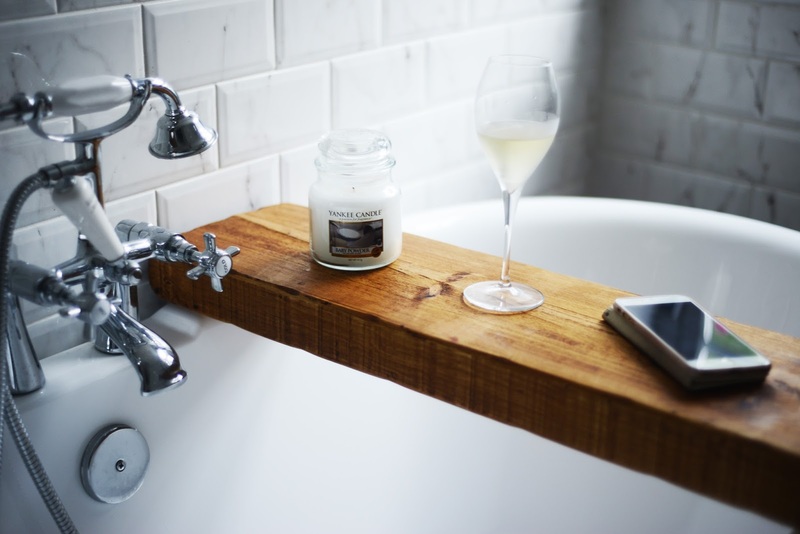 I found this amazing piece of wood, exactly the perfect length to balance on the edge of our bath that makes the most amazing fictional bath shelf which you can keep all your belongings on while you relax. The wood is actually an old shelf, its very heavy and amazing quality, but it was only £5! I think this is a such a modern and stylish way to add a function piece to your bathroom with so many uses that isn't that awful tacky chrome or dated white plastic material but something actually quite fab! Theres so many ways you can incorporate this unique idea into your scheme whether that's by painting it or changing it slightly to include wine glass holders in the sides or even little side pockets attached to the sides to hold your essentials. I've had so many comments on my little idea and thought that some of you might be interested in this quirky idea that might transform your bathroom too! Just a fun and functional tip to change our bathing game to the ultimate relaxation space. Since my amazing Nana passed away earlier this year, we've had lots of family photographs to sort though, which is actually one of my favourite things to do! A lover of all things old fashioned, I really wanted to celebrate my Nana and all her old family photos in style and display them in my home. Having these gorgeous pictures of my Nana's childhood on display is so lovely. So, with all these family photos I want to celebrate and love I wanted to find a gorgeous way to display them that really let their beauty shine. I discovered a really lovely and stylish way to display old photographs so they shine in your home as well as blend with your interior style and schemes. So, I picked up these gorgeous hinged glass frames from Homebase for £8.99 and £9.99 each. Also available from John Lewis, Cox&Cox and Not on the High Street. My favourite things about looking back is at the fashions. What I love about these unique frames is the industrial metal frame and glass on glass backing. 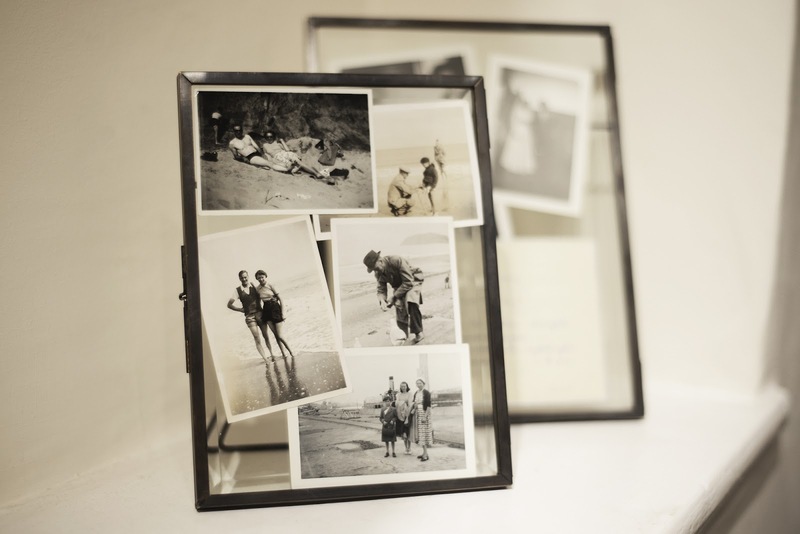 The style of frame is perfect for old photographs, they allow you arrange the photographs in a collage format, however you want. Which is perfect for old photographs as some may be different sizes, colours and possible a little damaged. But this whole look is so effective, and the glass on glass allows your interiors style to be visible through the frame so you don't need to be all about all-things-industrial to have these handy framed in your home. 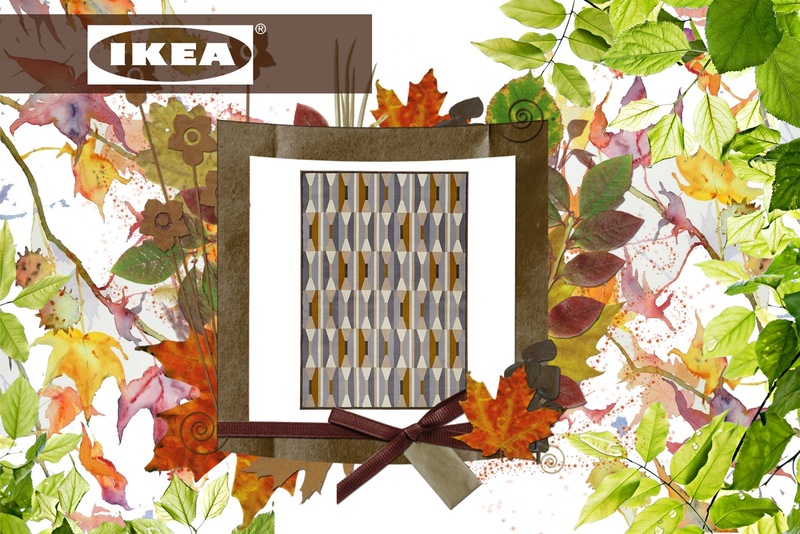 With these hinged glass frames you can be so creative. For example; Pressing flowers, using wallpaper as backing, displaying things you've collected over time like a scrapbook on display as well as a really lovely way to share you children drawings throughout your home. They come in loads of different varieties from landscape to portrait, standing frames, book opening frames or hanging frames. I'm totally obsessed with them! I could scroll through old photographs forever, looking at how our lives are so different. 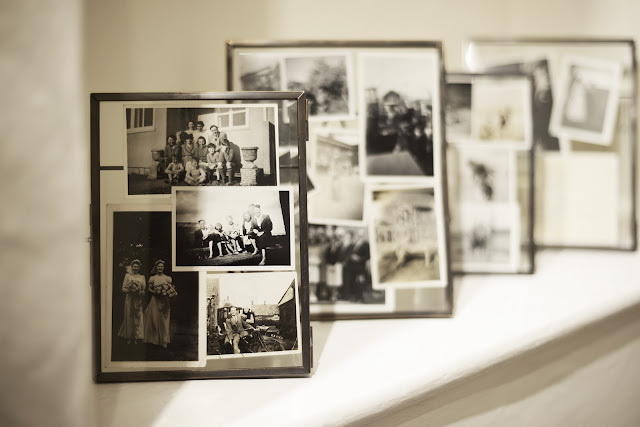 So, they're my tips for displaying old photographs in your home, and I definitely recommend getting your hands on a hinged glass frame as the possibilities really are endless and they make a gorgeous feature wall display if hung all together too. 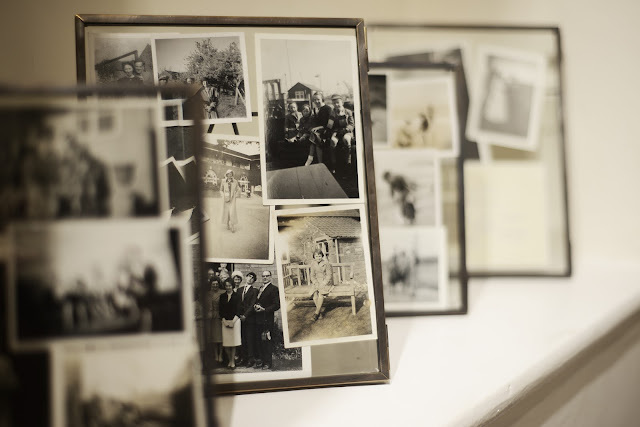 Let me know if you have any tips for displaying old photographs, I'd love to see how you display yours! 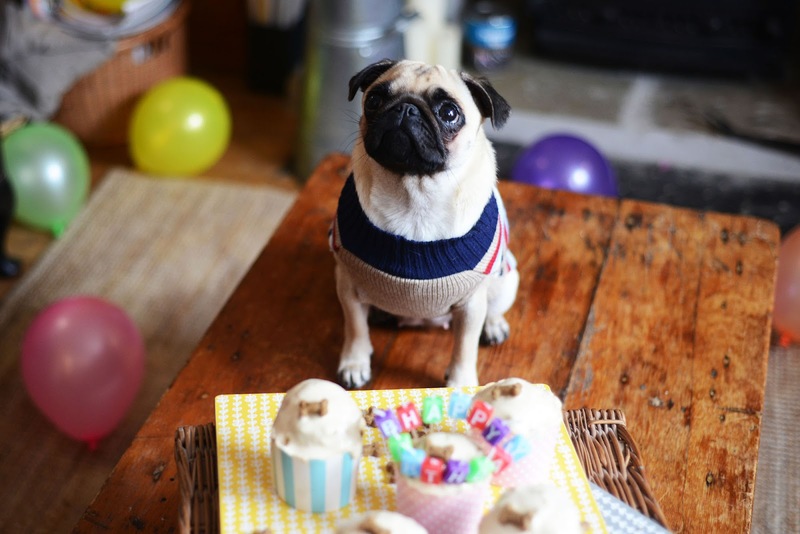 I can't believe where the last year has gone, as yesterday Arla turned 1! We first met Arla when she was 5 weeks old, and took her home at 8 weeks and 3 days old and since then, Tom and I have been completely in love with her. Happy 1st Birthday Arla bear! For a lot of people, having a birthday party for a dog seems ridiculous and crazy, but Arla isn't just a pet to us, she's like our child. 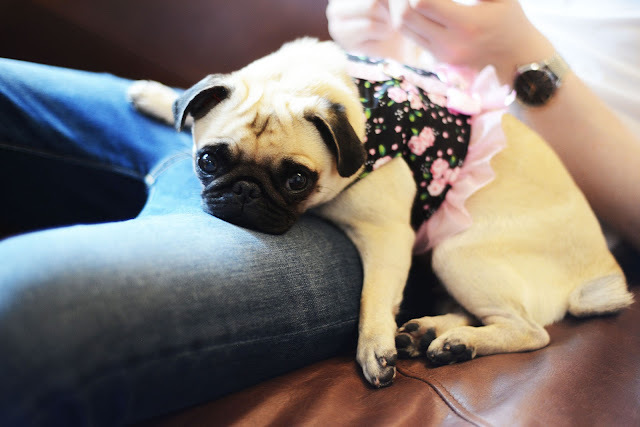 I've wanted a dog my whole life and have dreamt of owning a Pug for the last 10 years since I was 11. Going through Bipolar and depression from a very young age I always knew having a dog who had to depend on me would be amazing as having a companion to spend every day with. 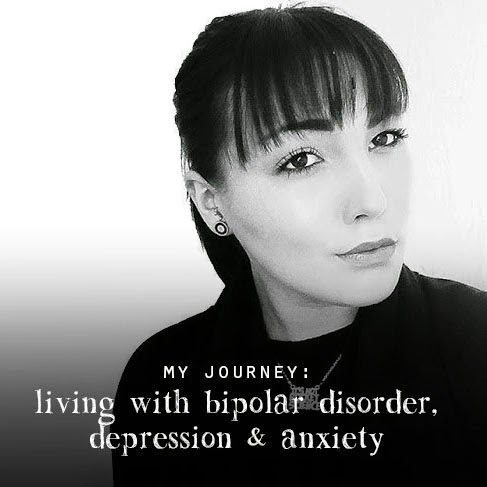 Arla has made a huge difference to my mental health situation and she helps me so much! She makes me feel loved and wanted, she makes me laugh and has me to depend on. She gives Tom peace of mind too when he's away with work that I'll be okay because I have Arla to keep me company. She's so playful and cuddly that we're like best friends, she never leaves my side. I've been such a happier and settled person since Arla came into our lives and she gives me something to live for and to wake up every morning with her so happy to see me is so special. So, yes it's a little crazy to have a birthday party for her, but why the hell not? "Mum, stop taking pictures of me now I want to eat the cake!" 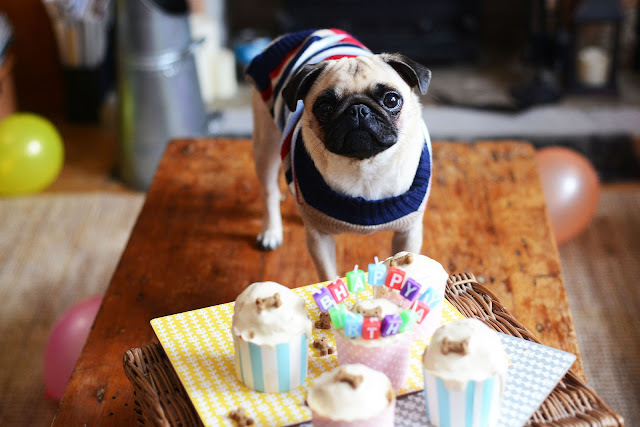 I wanted Arla to have a birthday cake, but not just for the birthday party effect, but an actual dog friendly birthday cake she can enjoy with her puppy pals! 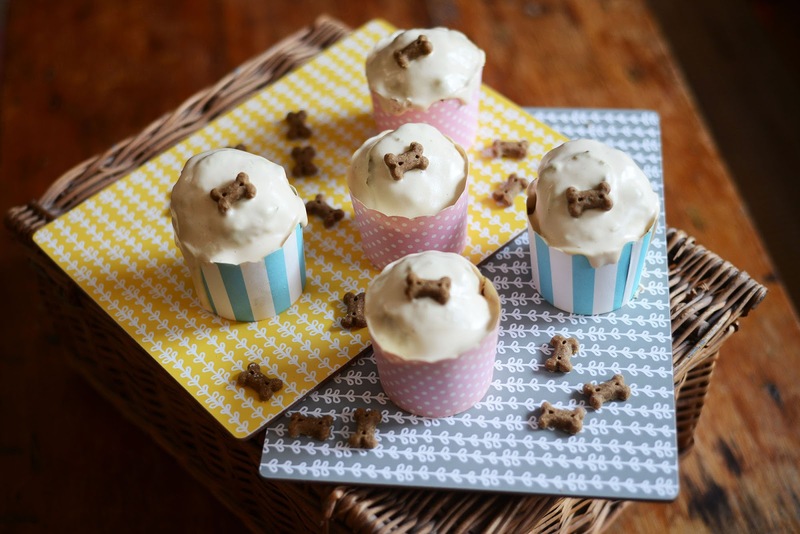 So I read lots of online recipes including Zoella's and created these adorable Pupcakes! 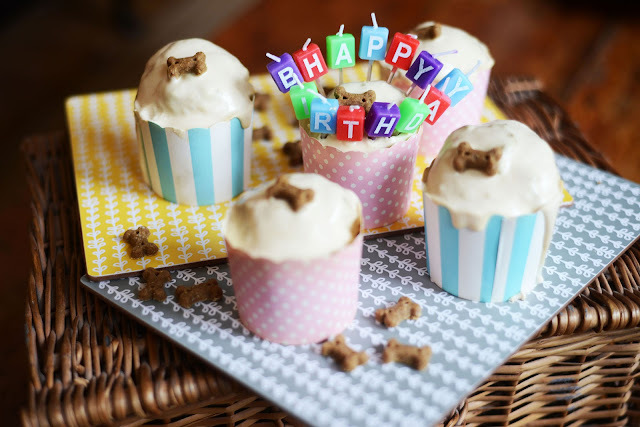 Pupcakes are a great idea to treat your pooch on their birthday! Put all ingredients (chop the banana) into a mixer a mixer at a high speed until everything is mixed together. Spoon mixture into cake cases and fill 70% of the cupcake case leaving some room for rising. 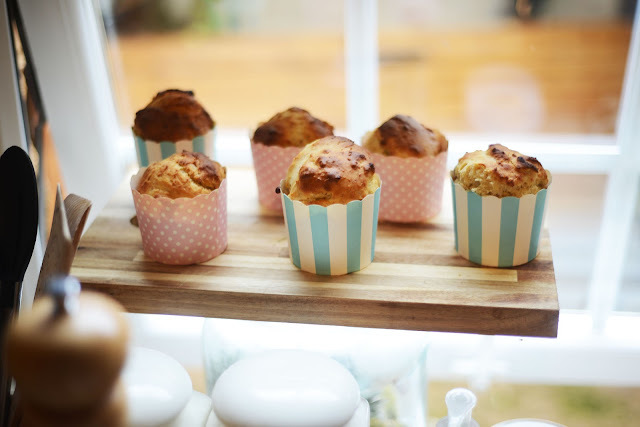 Bake for 15-20 Mins until fully cooked through. 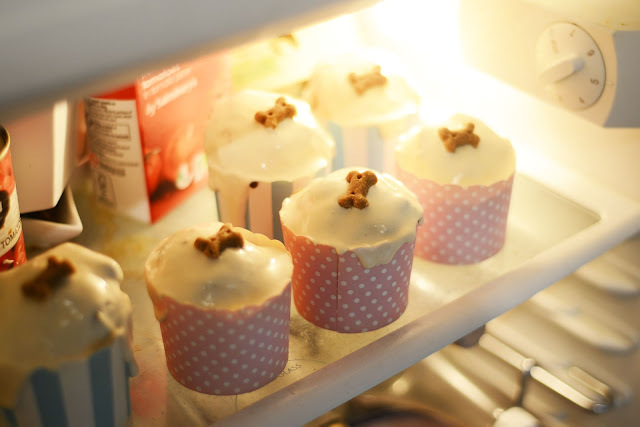 Remove from over and leave to cool, while making frosting. Put frosting ingredients into mixer and mix at high speed and whip as much as possible. Once cooled, spoon frosting onto cupcakes and decorate with dog treat before placing into the fridge to set. 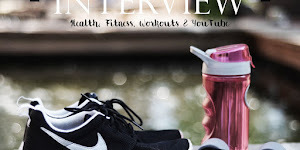 Give them to your pet and see what they think! Pupcakes are a cute and healthy idea to give your pooch as a unique birthday treat! 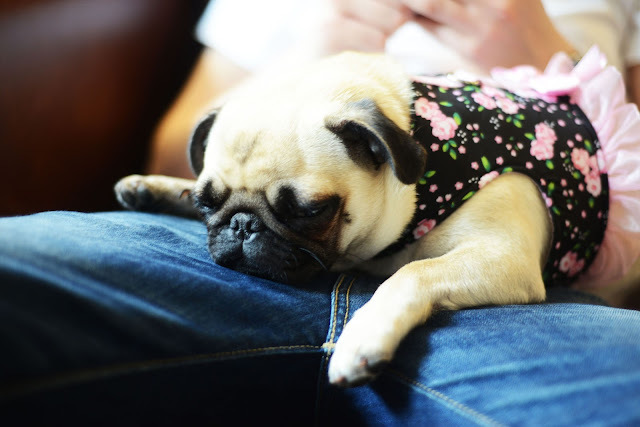 But after all the fun, it all got a little too much for piglet and she slept like a baby for hours on end! "What even is a birthday anyway?" She was well and truly party pooped. 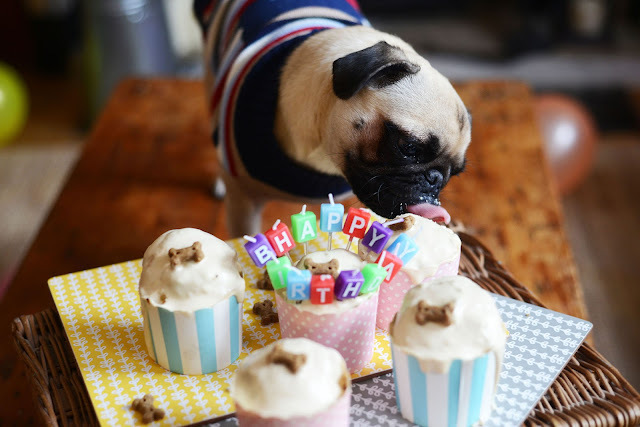 Thanks for reading, and for all of the Birthday wishes for Arla on my social media you're all super lovely! I've never been one for out-there makeup, but have always admired the adventurous! However, since getting more and more obsessed with makeup and watching tutorial after tutorial, I've realised I have become more interested in experimenting and trying out new things. For the past month or so I've been constantly wearing blue eyeliner. Blue eyeliner brings back memories of starting secondary school for me when we all used to wear white, green and blue eyeliner on our waterline and looking back, looked awful. Well, I've not been bringing that 2006 girl gang craze but I have been using a liquid blue eyeliner on my upper lash line with a cat flick and I absolutely love it! 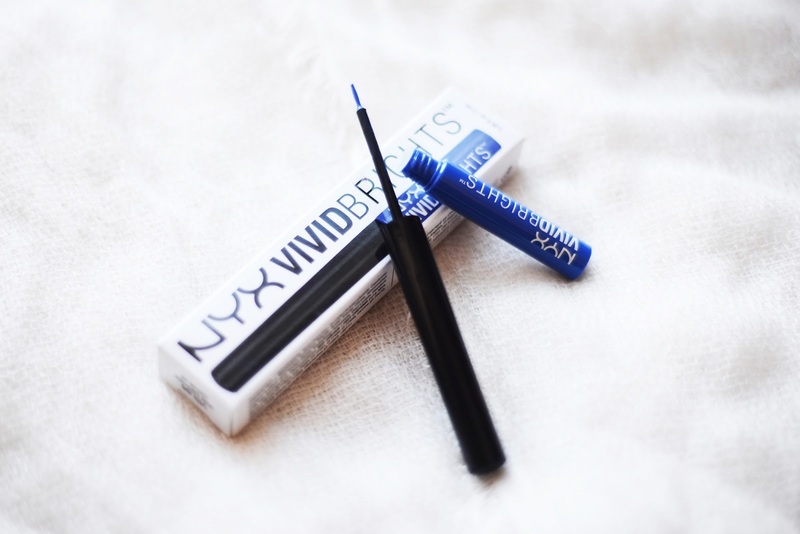 I first got the idea when I saw lots of people on YouTube raving about the NYX Vivid Brights Eyeliner Collection and instantly had to get my hands on the blue one called 'Sapphire'. 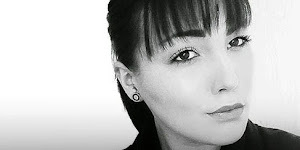 I was expecting much as the only eyeliner I've ever got along with was Loreal's Black Lacquer Liner, as with my hooded eyes and oily eyelids none other has every stayed on like Black Lacquer does. But I was pleasantly surprised by the NYX Liner which is a completely different consistency and applicator to the Loreal one I normally use. However, it's so easy to work with, simple to apply and dries completely matte and lasts all day. The liner is such a gorgeous colour it looks great with a subtle base, bold brows and subtle lip and it works its own magic and really is a wearable statement look you can wear in the day time too, or dress up for evening. I've already got my eye on the red liner in the Vivid Brights Collection too, and I can see myself slowly investing in the whole collection. I highly recommend giving these liner a try as they're so much fun and have made me feel a lot more confident about experimenting with makeup. My friends and family have given me such lovely comments every time I worn the blue liner, which makes me love it even more! After seeing this gorgeous palette raved about on social media I had to get my hands on it, I think it's the most stunning palette ever. 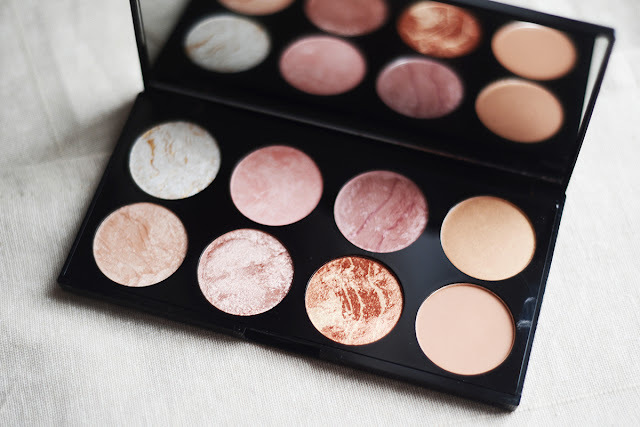 It's called the 'Golden Sugar Ultra Blush Palette' by Makeup Revolution and contains bronzers, merged blushers, baked bronzer and merged baked highlighters in the most amazing shade combinations. The most surprising thing about the gorgeous palette is the quality product you get for the price, at only £6.00 for 8 large pan shades. Makeup Revolution are a very respected brand for their price point and product variety, however I'm blown away by their packaging which is on par with so many high-end brands where this sized palette would be around the £30+ mark. As you can see from the swatches of the pans bellow they have a huge pay off and incredible pigmentation, great for using as blushers with a stippling brush or a fan brush as highlighters. There is also two bronzer shades, so if you love your sculpting and highlighting, this palette is a must for the ultimate glow. Not only does this palette look amazing and is a work of art visually but the quality of the products is like nothing else in the drugstore price point. 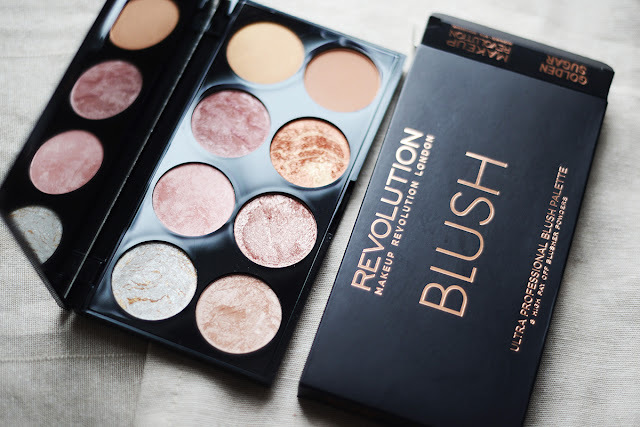 Makeup Revolution are a brand highly recommended for high-end dupes and I think this palette is a must have product for every beauty lovers collection at only £6.00. 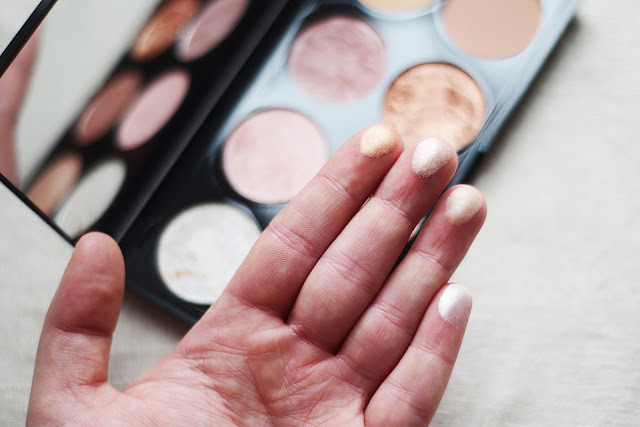 Huge paw off and pigmentation with these blush, bronzers and highlighters. 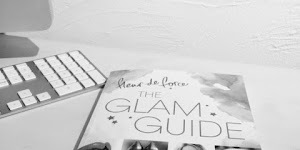 Based on the swatches alone, many people would be surprised at the affordability and availability of this product and would most probably presume it had a high-end price tag when looking at the product, swatches, pay off and packaging - which also includes a huge handy mirror, which is usually absent on quality drugstore products. I have a lot of respect for Makeup Revolution for offering such amazing products at their price point, because most of the time if something works this well and is this fantastic the price point is usually much, much more. Granted, due to the amazing wallet friendly prices, these product can sometimes be hard to get hold of as the stand in Superdrug is always crowded with other MR fan. 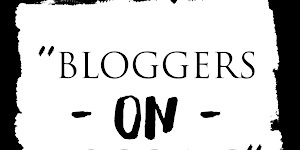 However, you can get them on the Makeup Revolution and Superdrug website, so panic not! I think this palette, and Makeup Revolution as a brand should be raved about as much as possible. Being able to get such quality products at these prices is so refreshing for the beauty world and I'm so proud we're able to get hold of such an amazing brand in our local drugstores.